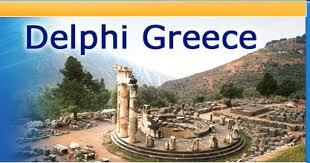 Two (2) days guided tour to Delphi. Follow the Greek dancers and visit Delphi on a two-day tour. April to October - Daily. November to March - On Mondays, Wednesdays, Fridays & Sundays. Departure 8:45am, Return 19:00 - Pick up / drop off arranged. THEBES - LIVADIA (short stop) - ARACHOVA - DELPHI ( visit museum and site) - ATHENS. Visitors spend a day of complete relaxation in DELPHI where the wild beauty and grandeur of the landscape are awesome and inspiring. N.B. Your stay in DELPHI can be further extended, paying the hotel accommodation without any additional charges for transportation. After lunch of the second day, you will start your return to Athens stopping at the picturesque mountain village of ARACHOVA(short stop), built on the south slopes of Parnassus, well known not only for its attractive hand-woven carpets, rugs and quilts, and for its wine and cheese but also for a great victory of the Greeks against the Othoman army in the revolution of 1821. The 3 days traditional PANIGIRAKI celebration in Arachova during Saint George's nameday. If you are in Athens on the day before St George's nameday (usually April 23rd), take the two day tour to Delphi and late afternoon of the first day travel to Arachova and watch the local "panygiraki" festival. For the rest of your life you will remember the sport events, the elders take place in, to honour St George. Old, but very strong men, over 75 years old, running a 60 m race, on a very steep hill, the same hill where the battle took place. You will definitely be impressed by the celebrations that are organised in the village. Over 3000 villagers, adults, youth, children and babies, dressed in colourful local dresses follow St George's icon in a procession in the streets of the Arachova village. And on St. George's day come again to Arachova, watch the "lamb on the spit" custom and taste the roasted lamb. The rest of the Greeksroast the lamb on "Easter day". In Arachova they do it on both days; Easter and St. George's nameday. DO NOT MISS THIS DAY IN ARACHOVA. See our discounted rates. You are one step before making your booking, CONTACT US..